Visiting Apex Tech? Check out what our campus has to offer. 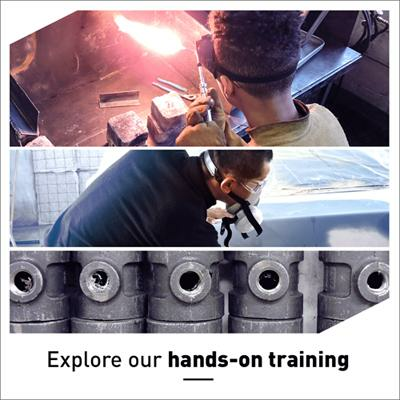 At Apex Technical School’s campus, students engage in focused programs on a specific technical trade. With at least 50% of student time spent in a shop setting, they have access to tools and equipment that provide a hands-on campus experience. Apex students are immersed in a tight-knit community as they work closely with peers on shop projects they’re passionate about. Apex has a Federal Work Study program for those students who qualify – check out the financial aid page for more information. You can get to know the school even better by learning about its unique history and visiting us. Contact us today to schedule your visit. Our 75,000-square-foot training facility is equipped with elevators, and the building is accessible to persons with disabilities. 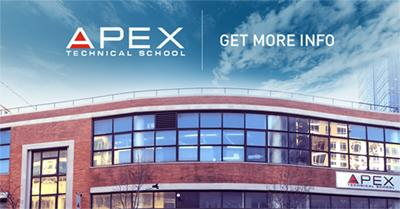 Apex Technical School is located at 24-02 Queens Plaza South, Long Island City, Queens NY 11101. In the heart of Long Island City in Queens, Apex is easy to access from the Greater NYC area by car and several subway lines. We encourage individuals to consider visiting the Apex campus so you can see students at work, meet instructors, and talk to Admissions. You can find directions from your location, including Manhattan, the Bronx, Queens, Brooklyn, and Long Island, below. Classes are starting soon! Call us at 212-645-3300 to find out more.